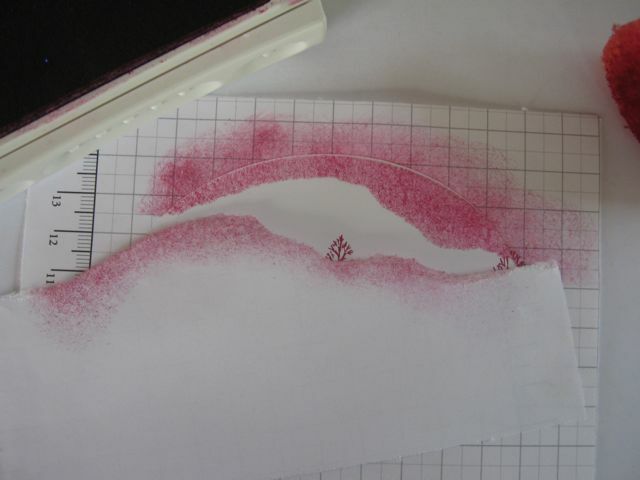 Tutorial - Masking and Sponging. 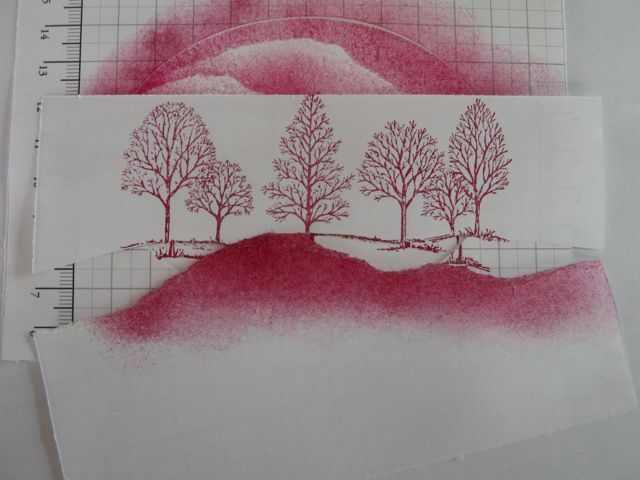 Masking and Sponging Tutorial Using Stampin Up's "Lovely As A tree Stamp Set. 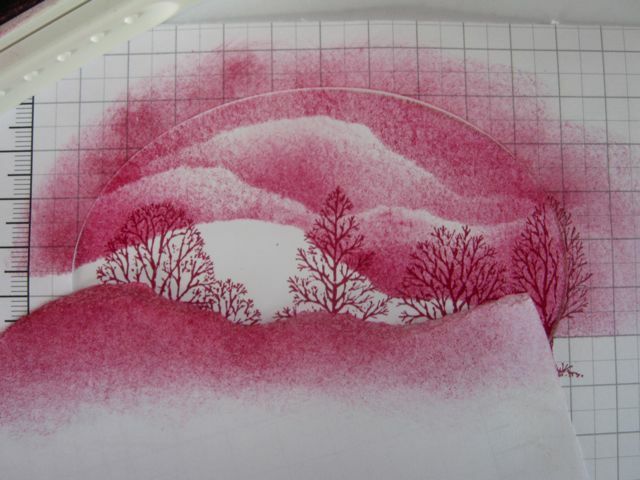 This Masking and Sponging technique looks quite complicated, but in fact is quite easy and requires just a few products to create a fabulous effect. Give it a try and have fun. There are no right or wrong things to do, and I will give you a couple of little technique hints along the way. 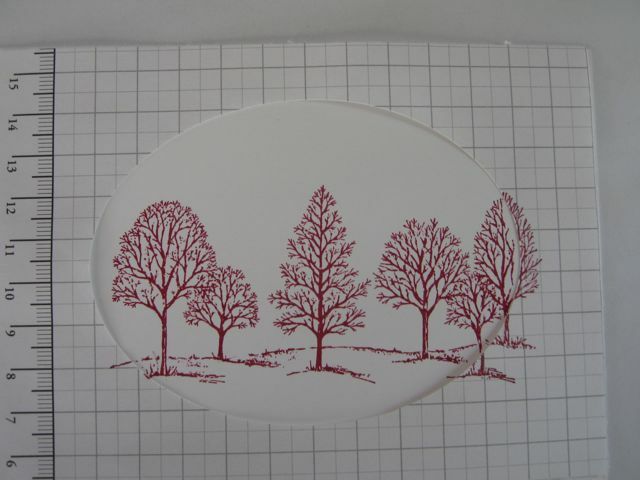 Stamps: Lovely As A Tree stamp set from Stampin Up. Card Stock: Whisper White and Purely Pomegranate. 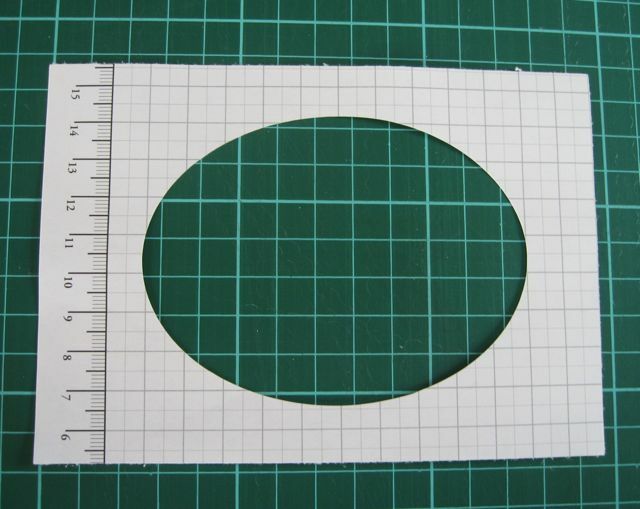 An oval mask cut from scrap paper. An A5 size piece of scrap paper to tear for background masks. Step 2. 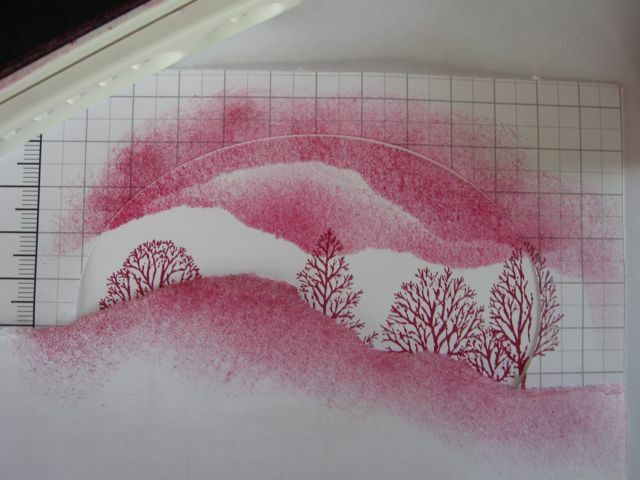 Place the mask over your card stock and stamp the trees. Step 3. Tear an A5 size piece of scrap paper across the middle. 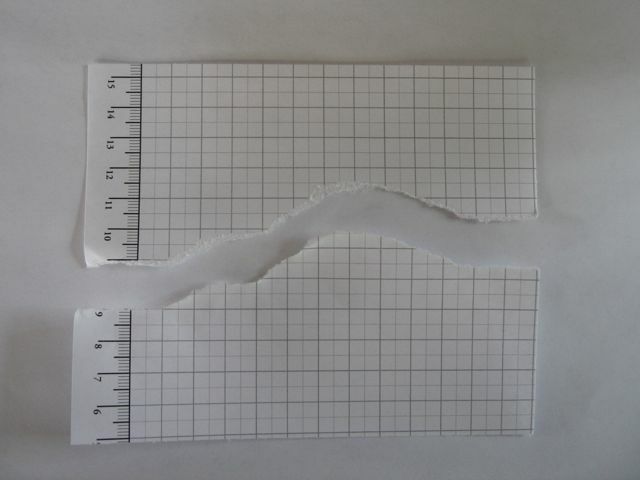 You can control the tearing motion by placing your thumbs together at the front of the paper and tearing a little at a time, moving the thumbs as you tear. Step 4. 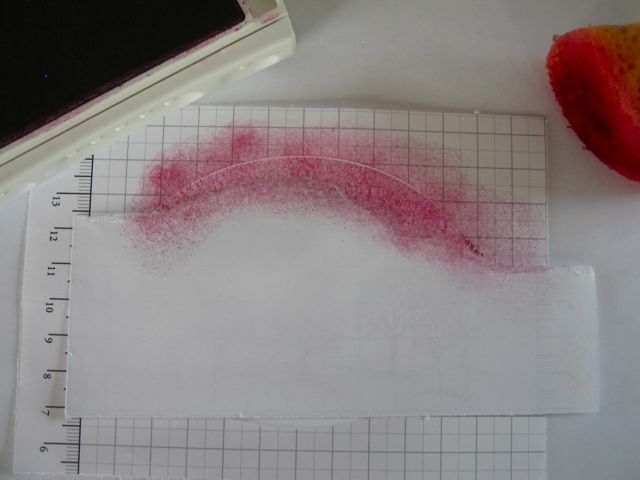 Load the sponge with ink by rubbing it onto the ink pad. Caution here with reds and other strong colours- a little goes a long way. Place the mask across the oval mask and lightly dab the sponge across the exposed area. Step 5. Remove the torn mask. Step 6. Reposition the torn mask lower and on a slight angle to the first position. Step 7. Repeat the process of moving the mask until you have created "clouds" or "mountains" close to but not touching the horizon of the image. HINT: Keeping the horizon light gives a good effect of distance. Step 8. 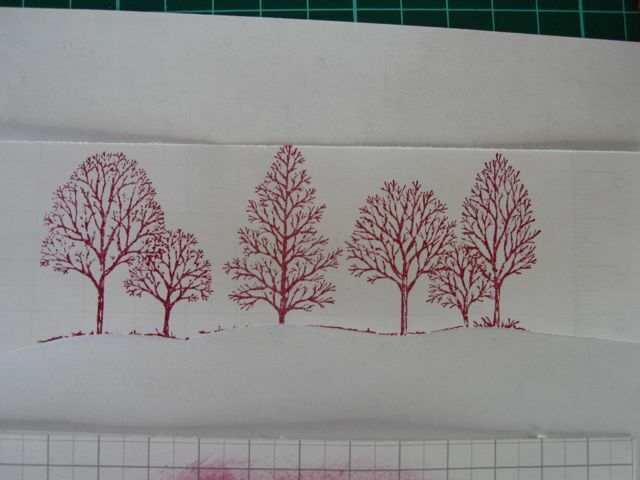 Stamp the tree image on the other half of the torn A5 scrap paper, then use paper snips to cut along the horizon line. This will form a mask for the sky area. Step 11. 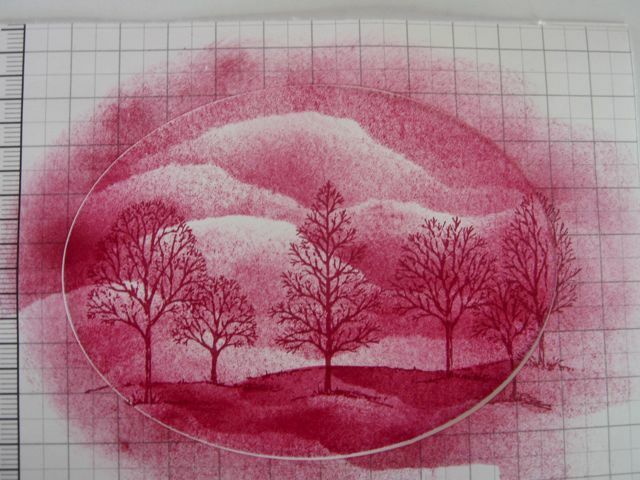 Now position the mask you used for the clouds, over areas on the grass and sponge the ink on. Start lightly, but you can build up the ink here to be quite dark if you choose. Step 13. 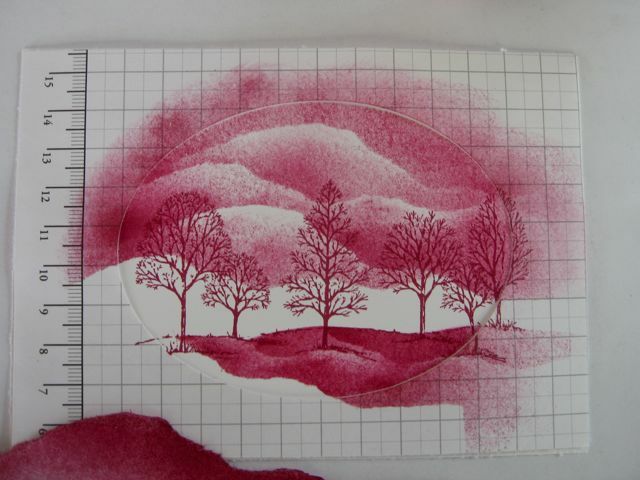 Move the mask around and continue to sponge ink onto the card until you have achieved some rolling hills. HINT: Apply more ink closer to the edge of the mask and less ink further away from the mask - this will give you variation and shading. Step 14. Remove all masks and view your work. Step 15 Position large single tree over part of sponged image. 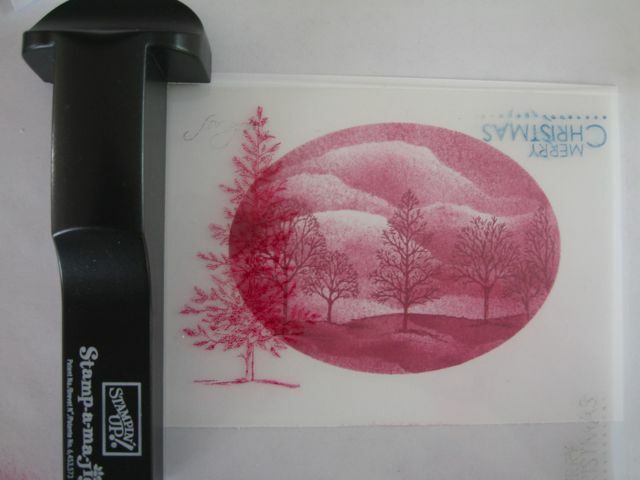 Use a Stamp-a-majig to ensure you position the tree where you really want it. 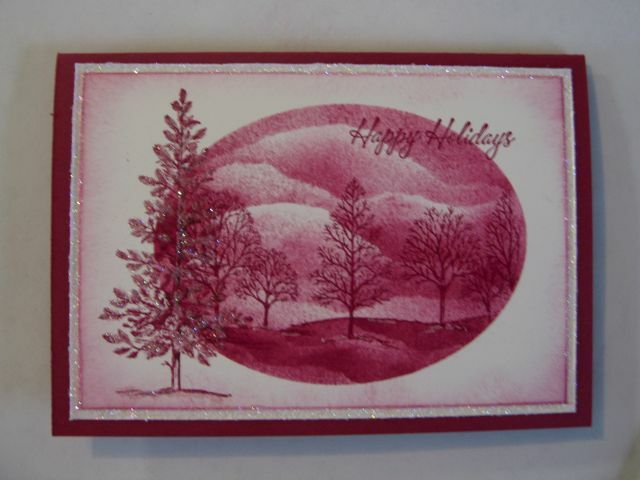 Complete the card with a greeting and then sponge lightly around the edge of the white. Matt this onto another white piece that is slightly larger. 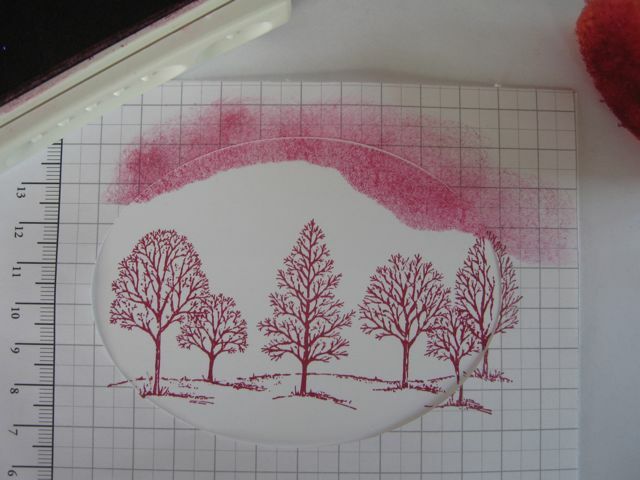 Use a 2-way glue pen to pick out highlights of the large tree, and sprinkle with Dazzling Diamonds. Finally layer onto Purely Pomegranate A5 sized card. I also added some highlights with my white gel pen. These look great in a variety of colours, so pick out your favourite colour and try it.